When the autopsies of three suspicious suicides reveal small burns on the brains of the victims, Eve's investigation turns to the provocative world of virtual reality games--where the same techniques used to create joy and desire could also prompt the mind to become the weapon of its own destruction. On the story: When people who have everything to live for commit suicide, Eve quickly takes notice. Determined to figure out the pattern and against all odds, Eve finds herself on the case. Reaction: The premise of this one really freaked me out. Sometimes technology can be so scary. 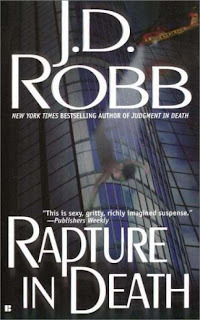 Roarke check-in: Roarke was as sweet as ever but Eve stole the show when she showed her heart and vulnerability in this one. They are truly the perfect couple. On the story: When a retired cop dies unexpectedly and with a suspicious toxin screen, Eve is asked to put her job before her loyalties. There are lots of smoke and mirrors but Eve must recognize what is real and what is fake before it is too late. My reaction: This one tugged at my heart. Some of the actions were so grotesque and vivid. I just couldn't put this one down. The mystery is this one is more intriguing because we know the bad guys early on but just don't know how they managed to do the deed. Roarke check-in: I imagine that Roarke was Rhett Butler in an earlier life. With a sigh, she settled down, closed her eyes, and willed her mind to empty. Beside her, Roarke smiled into the dark. In a time when technology links the law and the lawless, predators and prey can be one and the same... He is an expert with the latest technology ... a madman with the mind of a genius and the heart of a killer. He quietly stalks his prey. Then he haunts the police with cryptic riddles about the crimes he is about to commit--always solved moments too late to save his victims' lives. Police lieutenant Eve Dallas found the first victim butchered in his own home. The second lost his life in a vacant luxury apartment. The two men had little in common. Both suffered unspeakable torture before their deaths. And both had ties to an ugly secret of ten years past--a secret shared by none other than Eve's new husband, Roarke. On the story: At first I thought this one would have a similar premise to the previous but it quickly took a different track. A murderer is on the loose enacting revenge for a long-ago crime. Unfortunately this time, the ultimate target is Roarke himself. My Reaction: Forget the mystery. There is so much Roarke and Eve loveliness, this one won't easily be forgotten. I was mush for most of the book. Don't get me wrong, there is an incredible mystery at the center of this one but it plays on the relationship between Roarke, Eve, and Summerset, so brilliantly. This time there is little separation between the mystery and the romance. 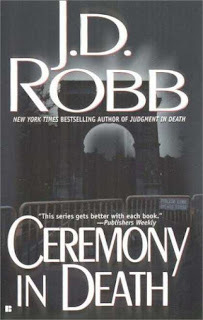 Roarke check-in: Roarke is front and center in this one and I loved every minute of it. There is a very specific part where Roarke emotions are high and we get to be in his head. It was so powerful and sweet that I read it multiple times. I could feel the raw emotion and I loved it. Have you read any of these? Thoughts? Honestly, the names and covers are so similar that is so difficult to remember what happened in each one. Rapture and Vengeance... those words could really go for any mystery. I really dislike that about this series. I've heard a lot about this author and the books but never read any of them. Not sure they're my thing although I don't mind reading this type of book sometimes. On another note sorry I haven't been around. Dad was in the hospital again and I'm so behind on blog reading. I'm trying to catch up with everyone's lives now. I completely understand. No need to apologize. I put it off and put it off. Then I gave it a try and became hooked. I haven't had a chance to read this author...but obviously I need to!! LOL I do like a good romantic suspense though, something to keep me at the edge of my seat. I was the same way. Romantic suspense is the best of both worlds. I keep seeing these books around and they look pretty good. I'll have to take a closer look. Let me know if you give this series a try. I always get that feeling every time I start a new one in this series but they soon diverge away from the others. I understand the feeling but so far it has worked out. 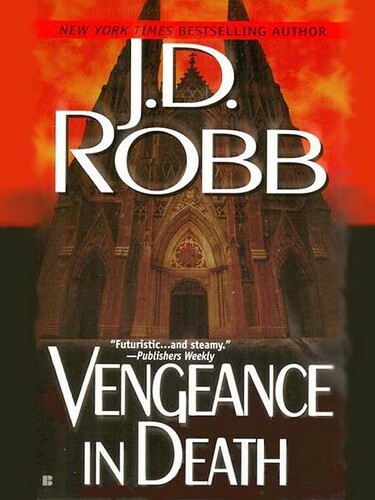 Vengeance in Death breaks my heart a little bit (any mention of Marlena usually does), but it is a great entry to the series. 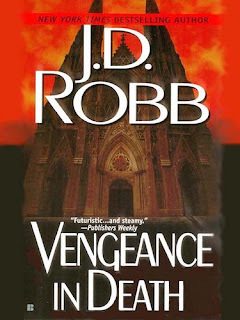 I love the insight into Roarke and Summerset's history, and I also like how Eve and Summerset's relationship develops (Janet Evanovich, take note!!). I'm listening to Reunion in Death right now (a reread) and I'd forgotten how heartbreaking this one is too, with Eve taking a trip back to Dallas for the first time. I recommend that one too. Now I can't wait to get to Reunion in Death. These books can get to me at times.